RUNAWAY PRINCESS is one of my personal favorites. Evangeline is a librarian and when confronted with dire situations, she responds by remembering what she read (karate, rappelling, rafting) and doing it to the best of her ability. The whole story is so much fun it makes me smile — and I hope you smile, too! Now with a new cover and a bonus excerpt of WHAT DOESN’T KILL HER. Mystery and anonymity shielded the solitary, sumptuously dressed lady staying at Europe’s most exclusive spa, but Prince Danior of Baminia recognizes her. She is the princess of Serephinia … and his long-lost fiancée. The future of their kingdoms depends on their marriage, and Danior is determined to unite their troubled nations — whether the runaway princess wishes to or not. English orphan Evangeline Scoffield has spent her life contenting herself with dreams. But with an unforeseen inheritance, she can afford one perfect summer. So she buys elegant clothes, travels abroad, and begins a deliciously exciting masquerade … until, that is, a furious stranger appears claiming her as his own. Her denials count for nothing. He will do anything to have her. Seduce her, abduct her, or when danger explodes about them, flee with his unwilling bride into a world of peril, promise and passion. Ignoring the speculation, Miss Evangeline Scoffield posed at the door of the dining room and waited for the maitre d’hotel. The flurry of whispers started in a dozen languages. This resort had once been a private chateau near the Spanish border. Now Chateau Fortuné was one of the crown jewels of the grand tour, and Evangeline reveled in being one of its shining facets. Her emerald silk skirt created a satisfying rustle as she threaded her way past the white linen-draped tables, and without appearing to, she observed the heads that swiveled her way. With a flourish, Henri pulled out her chair. Seating herself, she placed her drawstring clutch on the table and draped her Brussels lace stole around her shoulders. Then in rapid succession, the waiters poured her a glass of fragrant, ruby wine and laid the snowy napkin in her lap, while Henri announced her choice of soups and entrées. The mere recitation made her close her eyes in anticipation. She loved good food. She loved eating in such an exquisite setting. When she finished placing her order, the four men bowed and backed away from the table. They were kind, even beyond the kindness she bought with her generous gratuities. Was it perhaps because they felt sorry for her? Evangeline’s heart gave one huge thump, then resumed its usual smooth beat. Henri was exaggerating. Men showed themselves remarkably able to resist her charms. “Thank you, Henri.” She ignored his reproachful glances as he backed away. Tearing a roll into halves, she buttered it and took her first, heavenly bite. Her eyes slid closed as her teeth crunched through the crust. She adored France. She adored the language. But most of all, she adored the bread. Embarrassed by the sensual pleasure she found in a simple loaf, she hastily opened her eyes — and saw him. He was virile, and he was watching her.She observed interest, speculation, and an intense … well, it looked like … but it couldn’t be. Possessiveness. The sound of a shower on her silk skirt distracted her, and looking down, she realized she had squeezed the piece of bread until the crunchy golden crust flaked and fell into her lap. She placed the mangled roll on its designated plate. She brushed at her skirt. Steam rose from the soup. Soup. So plebeian, so normal. Just like her. She’d never given a man reason to be possessive about her. Controlling the tremor in her fingers, she grasped the spoon. Dipping it into the broth, she lifted it to her mouth. Good sense returned even as she swallowed. Her spinster mind, egged on by Henri’s melodramatic speculation, had exaggerated the stranger’s regard. The stranger watched her, yes. But no doubt he watched her with the same inquisitiveness — oh, call it by its true name, nosiness! — as did the other pleasure-seekers bent on satisfying their every appetite, including the hunger for scandal. Taking another spoonful of the soup, she sighed as the flavor of oregano pursued the fish and roasted garlic. Yes, soup. Heavenly. Ordinary. Yet a chill chased up her spine. Imagination, she told herself. Nevertheless, she experienced the urge to look up, and as Henri whisked the soup bowl away and replaced it with the plate of lamb, she did so. The stranger stared directly into her eyes, and he lifted his glass in salute. Her lungs ceased to function. Her heart leaped, and she gawked like a rabbit mesmerized by a snake. His ebony lashes framed blue eyes; she could see that even from across the room. But not sky blue, or cornflower blue. Burning blue, blazing with a passion for … for what? For her, if his wolfish smile was any indication. But for all his hungry display of teeth, the stranger did not seem to be starving. His tailored black frock coat outlined shoulders broad as a peasant’s who worked the fields. His hands were big, so big they swallowed the wine goblet he held. His smile expanded to rapaciousness. She found herself on her feet. She had to leave this place. Now. She turned her petrified gaze on Henri. His wail sounded in her ears as she hurried through the crowded tables toward the door. Eat? She couldn’t eat. A strange man had looked at her. Looked with an intent she’d seen directed only at others. The buzz of conversation grew around her as the tourists noticed her retreat. She was hurrying like a woman forced, through desperate circumstances, to earn a living. She had hoped never to hurry like that again. She continued her race to the entrance. She reached the portal and continued past the comfortable sitting chamber, along the dark, empty hallway to the double doors at the end. With trembling fingers, she fit the key in the lock. The door opened, she stepped inside, and closed herself in. She leaned against the door, her heart pounding. Had the stranger chased her? Was he even now striding toward her bedchamber? Pressing her ear to the polished wood, she strained to hear footsteps, but the thick walnut muffled any sound. Was he standing out there, preparing to knock? She couldn’t bear the suspense, and taking a deep breath, she whipped open the door. The corridor was empty. No one was there. No one had followed her. Feeling prodigiously silly, she locked herself in. Whatever made her think she could pull off this deception? Ruefully, she looked around the bedchamber lit by the soft flame of beeswax candles. Deep-grained walnut paneled the walls. The enormous, comfortable bed was hung with brocade velvet curtains. The frame rested on a dais that every night made her feel like a princess as she drifted off to sleep. She loved this room, but it was time she admitted the truth. She was a fraud. Kneeling beside the bed, she groped at the ropes that supported the mattress until she found the carpetbag. She’d felt the lump it created in the mattress every night as she drifted off to sleep, and she had exalted in it, for this carpetbag contained the key to her independence. Gripping the handles, she wiggled the bag free and dragged it forth. Opening it, she removed the bound sheaves of pound notes, laid them out on the carpet, and counted them. Three thousand pounds. In less than a month, she had spent half of her inheritance. Covering her face with her hand, she fought the hard, cold truth, and lost. 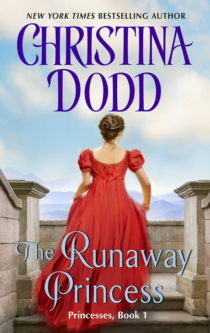 She knew she had to go back to England, before Leona’s legacy had been wasted chasing a dream of adventure and romance. There remained enough money to open a bookshop. She knew more about books than any woman in all of Britain, and she could make a success of it. Yet … yet … she lifted her head and stared drearily at the wall. Was she going to live and die after such a brief taste of pleasure? The knock made her jump, and she stared at the door with dismay. “You also dropped your gloves,” he said.